No one with autism has done as much for people with autism as this woman. Seeing her live was fantastic. More NCTE to come! Amazing conference. Election Night - A Victory Party! Those that have known me for more than a few years know that politics run deep with my family. I'm not one for running, personally, but through my father and uncle I grew up working a plethora of campaigns -- everything from writing literature to knocking doors. This past weekend I went out and dropped a piece for my good friend Jeremy Mahrle, as well as the coordinated party on his campaign, Sharlan Douglass. Both were on the ballot for Royal Oak City Commission, and both were victorious! I moved from Royal Oak about a year ago into neighboring Clawson, but I still have ties to the community and feel they will be a great voice for the growth and prosperity of the town. Mayor Ellison looks on as the head of One Royal Oak campaign thanks supporters for backing the successful Human Rights Ordinance. Jeremy and his campaign manager, Alex, to the left of Mayor Ellison. Sharlan, one of the new commissioners, thanking supporters. Jeremy, also now a confirmed winner, thanking supporters as Sharlan applauds their victory. A good friend of mine, Kerry, is in a local cover band named Collision Six. I made it to one of their shows this past weekend, and while pictures don't display the fantastic quality that is their fun, upbeat performance of well-known hits, I will post a few anyway. Feel free to check them out on Facebook at www.facebook.com/c6band or at a local show, because they play all over the Metro Detroit and Lansing area. Ford Field was kind enough to allow my camera and I inside, and my wife's company got us some AMAZING seats. These things happen when you do a great job, and she's pretty wonderful. Being that it was the Alumni game, Barry Sanders stopped by! 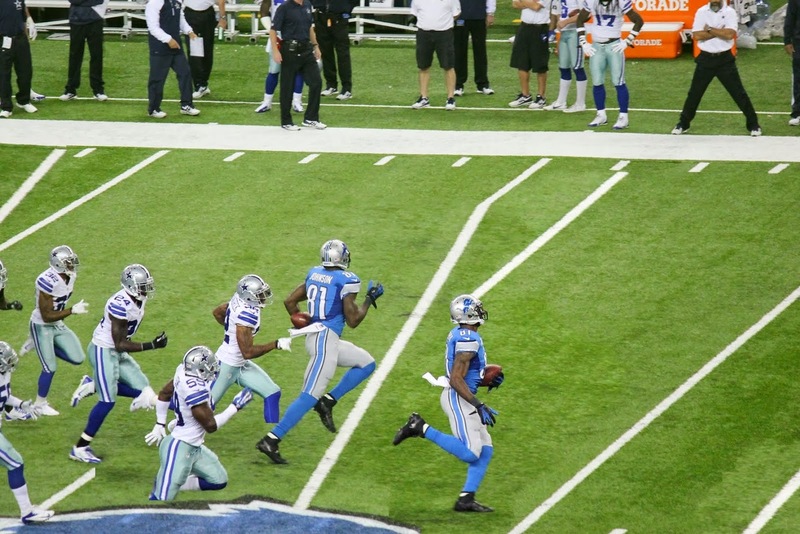 The game winning kick, putting the Lions up 31-30.